"The Chemistry of Essential Oils Made Simple: God's Love Manifest in Molicules"
Phenomenal! This book hardly deserves to be deemed a dry category of chemistry! Dr. Stewart makes, what is for many people a boring subject, something alive and full of interest. For the first time, I understand how chemistry and vibrational frequency relate. He has done a great service for those of us in healing work and in the art of aromatherapy. The book is truly a treasure for those with or without a scientific background. President, Healing Touch Spiritual Ministry, Inc.
As a nurse for almost 30 years, Dr. Stewarts book has finally given me scientific permission to follow the whispers of God in my heart. Ive always felt led in the care of the patients God has brought to me, but I often yielded to what medicine mandates instead of honoring Gods leadings. Dr. Stewart reminds each of us to listen and be inspired by Gods handiwork. This is a historical work!. I congratulate you and thank you, Dr. Stewart. Your chemistry book is fabulous and will be a best-seller. I love the humor, simplicity, depth of knowledge, and the way you have brought science and religion together, as it should be. This is a book I definitely want to carry here at my center. It will help the lay person, as well as the scientist, to understand the profound healing effects of essential oils within the human body and how to use that information to both select oils and to prayerfully decide a course of action to facilitate healing. Thank you so much for taking the time to write this book! We are delighted to recommend this book. It is the first to address positively the dilemma over supposedly toxic oils as well as the undoutedly beneficial use of certain oils neat for certain conditions. It is refreshing to find someone else who feels our wonderful essential oils are unnecessarily maligned when all that is needed is more knowledge on the chemistry, which this book provides. The book also rightly explains how tests done on animals with single components or perfume quality oils cannot be related to the use of genuine essential oils on people. What a wonderful reference!! A must read for any one wanting to understand the chemistry of therapeutic essential oils and how they can be of value to mankind.A great source for both the layman and the professional alike. David has made the science and chemistry of essential oils easy to understand. This is one book I want in my library. With a kiss of the Divine with nature, Dr. Stewart has created another masterpiece! He has brilliantly woven his artistry to bring the Spiritually etheric oils into the Scientific realm for our understanding of nature's physicality and purpose. In this informative, practical and down-to-earth book, Dr. Stewart takes the reader on a chemical journey from the infinitesimally small structure of a molecule to the Infinite Cosmos revealing God's signature in all of creation. God's love has also manifested through Dr. Stewart's dedication in his written words. This is a magnificent must read book for anyone using essential oils. Sabina M. DeVita Ed.D., D.N.M. A truly inspired work of art. A blending of the spiritual and scientific wonders of the gift of essential oils on this planet. This book opens up a whole new world of intrigue with fascinating presentations that lead to an understanding of how and why oils work in sync with our physical, emotional, and spiritual bodies. Dr. Stewart creatively weaves in stories which are so valuable for insight, clarification, and making this a wonderfully flowing story of Gods blessings. This book also has the best and clearest explanations I have ever found of pH, allergies, and other health-related topics. This is definitely the chemistry of essential oils made simple . . . as well as profound! I have just finished reading your chemistry book twice!!! I love it! You are amazing! I am wowed, enriched, and pleasantly surprised at the humor, love and simplicity of Chemistry explained by your Divine teaching. Thank you for sharing your precious gift with us!!! I love reading your chemistry book. Your introduction even made me cry. Your heart is so pure and wonderful, it so shines in your book. It is so evident that you LOVE what your writing about, that it makes reading the book so much fun! I've read the first 60 pages, and I'm excited about the rest of the book. An excellent book! Informative for the novice yet advanced for the professional as well. Well-written and easy to read because of Dr. Stewarts down-to-earth visual explanations. Far from a dry chemistry book. Just reading the Table of Contents makes you want to dive right into the book. This is a much needed book. There is no other publication like it. David has done a marvelous job in presenting the chemistry of essential oils in a clear, readable, and enjoyable way for everyone. A good scientific work. Lots of good data. I recommend this book to everyone who uses therapeutic oils and wants to understand how and why they work. A beautiful book. A musical chemistry book. Flows like music. A symphony in words. What a pleasure to read your new book. It is so enlightening. I thought your classes were great, but i must say that your book has really given me a deeper and fuller understanding of the chemistry of the oils in a way that is both useful in my practice and also for all people that are searching for answers to how these oils work and why they work so well. Your book is easy reading and the content perfect for myself inasmuch as I have no background in chemistry. I intend to keep it with the rest of my most important reference books. Man has nothing to offer for the extremes of pain and disease but to put one to sleepnumb to reality. God offers everything to awaken and give llife. David Stewart hax espressed this well in moledular terms. 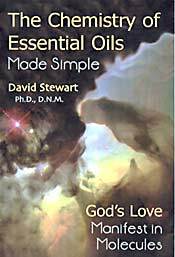 In this information-packed book, Dr. Stewart, a truly gifted writer and teacher takes us step-by-step from the basic building blocks of the physical universe to an understanding of how essential oils fit into the Divine Plan. This wonderful new book transcends the compartmentalism of modern science and religion, lifting us into a refreshing space where reality becomes a reverent understanding of Gods magnificent creation. This book is fabulous. Its brilliant. An invaluable resource to any student studying essential oils. Your knowledge and very honest views of the use of esssential oils are excellent, tactfully described, and yet humerous to read. The information is really superb. I am adding this to my list of recommended books for my students as an absolute must. Susan Duerden Neary, Cert. Ed. Hes done it again! Dr. Stewart's new book proves once again that nature is truly a testimony to Godeven at the scale of atoms and electrons. Even a child can see why chemistry makes sense when described in terms of the Creator. If chemistry could have been this clear when I went to school, it would actually have been fun. The awesome order of God's creation on a molecular level helps me appreciate His providence more than ever before. A treasury of scientific detail in common language that gives expanded meaning to Gods provisions for his children. This book fills an important need not met by any other publication. This book was so enlightening to me. I thought your classes were great, but your book has really given me a deeper and fuller understanding in a way that is both useful in my practice and also for all people searching for anwers to how these oils work and why they work so well. Your book is easy reading and the content perfect for myself as I have no background in chemistry. I will keep it with the rest of my most important reference books. a need and fill it. Dr. David Stewart has done just that by offering technical, scientific, and what could have been very challenging information in a simplified, interesting, easy-to-understand manner. For thousands of us who use, work with, and educate about therapeutic-grade essential oils, this is the piece we have needed to better understand how to choose our oils wisely for the most effective results. It affords us the opportunity to become more professional in our craft. Dr. Stewart is a rare individual who possesses the skill to combine his left-brain knowledge and expertise with a compassionate heart and a desire to bring his vast storehouse of information to the lay person in clear, understandable terms. This book is an amazing blend of the factual and the spiritual, woven together with Davids magical touch, which has produced a brilliant piece of work. This is an invaluable resource, and will take a prominent place in my library. In his book, on The Chemistry of Essential Oils, Dr. David Stewart has, to my knowledge, gone where no author has ever gone before. He explains the complex organic chemistries, as well as some practical uses, of these natural plant-distilled oils so that anyone with a high-school education can comprehend them. And he has presented the material in a wonderfully engaging way, undergirded by a devout Scriptural perspective as well! Readers will find in this volume a fresh, challenging, and complementary alternative point of view for the practice of medicine and the healing arts, which no doubt will stimulate some beneficial and much needed debate. I believe Dr. Stewart is on the cutting edge of a gentle revolution in American healthcare.